When does sh*t actually get real? You know it, dear reader. Sh*t is indeed about to get real. Maybe there’s no such thing as a dinosaur zoo. Okay, winter is not coming in anything more violent than the calendar sense. (Luckily, there’s totally a Batman.) But getting yourself emotionally prepped to take an active role in item G is totally a reality, and you’re going to need some help. Here’s our best advice to help sh*t get real as smoothly as possible. 1. It’s scarier to think about than it is to do. The anticipation of freefall is much more frightening than the jump itself. Loads of brand-new-skydivers-in-the-making report having trouble getting to sleep the night before, and our waiting-area couches have dents from the place where nervous folks have sat stock-still in terrified anticipation. Believe us when we say this: everyone is scared to skydive when it’s their first time. EVERYONE. That said, the tidal wave of fear dissipates just as quickly as you can say “three, two, one, jump.” We’ve been taking new jumpers for their first freefall experience for many years, and the vast majority insist that the scariest couple of seconds were the moments in the door. Once freefall takes hold, they report that giddy joy took over entirely. That’s good news, right?! Skydiving has gone through serious technological paces since the dawn of the sport in the 1950s. These days, the sport boasts an excellent safety record, and those numbers just keep getting better. 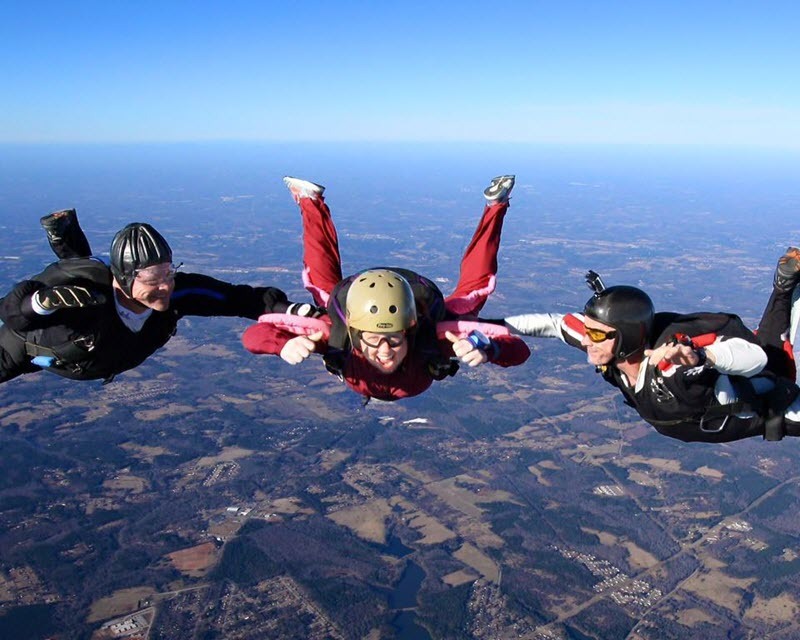 In the U.S., the United States Parachute Association recorded just 24 fatal sport skydiving accidents out of roughly 3.2 million jumps made in 2014. That’s 0.0075 fatalities per 1,000 skydives–the lowest rate in the sport’s history. And tandem? Even better. Tandem skydiving boasts an even stronger safety record, with 0.003 student fatalities per 1,000 tandem jumps over the past decade. 3. Your grandma can do it. That’s not even the most interesting part. What’s even cooler than the fact that people over 100 regularly make skydives is that thousands of seniors skydive solo for fun! There are even clubs for it, and records: the SOS (Skydivers Over Sixty), the JOS (Jumpers Over Seventy), the JOES (Jumpers Over Eighty Society) and even the JONS (the Jumpers Over NINETY Society). Yeah, okay–the JONS isn’t that huge a club, but the combined numbers of all of these groups could easily populate the raddest senior-living community you can possibly imagine. 4. You need to let sh*t get real so that you can be really, fully alive. Okay, so: What happens when sh*t doesn’t get real? Stories don’t happen. Magic doesn’t happen. Amazing changes don’t happen. Let’s put it this way: Once you’ve leapt out of an aircraft cruising thousands and thousands of feet over the mundane Earth below, what can’t you pull off!? Are you ready to start some sh*t? Get in touch with us today!